Dreams featuring spiders and webs are often creepy like a Halloween movie made by Alfred Hitchcock. Once you understand the symbolism you’ll see that there’s usually nothing to really fear, but there could be something to be wary of or some sort of danger lurking. To begin understanding what spiders in dreams mean, think about your associations with them. 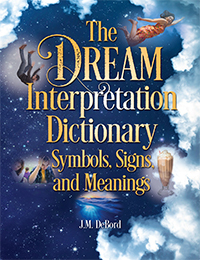 There is no universal interpretation for any creature in your dreams, but there are common associations that form the basis of most symbolism. A common association with spiders is they weave webs and sit back waiting for victims to get entangled. The spider can then take its merry time wrapping up and eating its prey. Spiders are patient and methodical. Now compare that to waking life. Have you ever been “entangled” in a situation that was “sticky?” Do you know people who lay traps that ensnare others? These associations are ready-made for dreams about spiders and webs, like this dream about spiders posted at Reddit Dreams. Looking back on that dream, I wish I would’ve picked up on the obvious: laying in bed with the girl probably symbolizes the dreamer’s attraction to her, since beds are where we dream and “dreams” in one sense can mean the things we wish for. But she has a boyfriend, a friend of the dreamer, and now we start to see a “sticky situation” taking shape. She might be trying to keep the dreamer “in reserve” like a spider’s meal wrapped in webbing so that if something happens with her current boyfriend, she has a guy to fall back on. There might be a subconscious competition between the guys for the girl. Poor guy doesn’t know he’s being played, but his dreams do. During my conversation with him at Reddit, he expressed a deep fear of spiders. Here is where personal associations come into play, because if you fear spiders, they can be used by your dreams to symbolize any fear. If you don’t fear spiders, your dreams can’t scare you with them! Now we get into a deeper lesson about dream symbolism. Dreams have a reason for every detail they provide and every symbol they use. A spider that symbolizes fear is going to somehow be associated with related ideas about spiders, such as fear of entanglement, of being trapped, of loss of control, or of predatory people. A spider is not likely to be used to symbolize, say, fear of water because spiders are usually not found there. I’m RadOwl. I interpret dreams. However, a personal association of yours could come into play in a dream if you’ve ever encountered a spider in the water. See how it works? Use the link earlier in this paragraph to explore that idea further. Spiders have close connection with anxiety because of how they produce anxiety in people who fear them. Just the thought of something lurking beneath your bed covers or in the corner of a room is enough to give some people the creeps. Snakes have a similar association, because even if you are not scared of snakes, you know to be careful around them. Anxiety is more about what could happen than what did or will happen. I’m at work and find a huge, hairy brown spider. I immediately felt a few things: fear, panic, desire to run. In the meantime.. one of the senior techs in my lab who I have the upmost respect for, and a little bit of fear of, caught said spider and placed it in a sort of container that magnified it and made it look even bigger. She kept trying to force the spider on me. The spider in the jar is magnified so it looks bigger and nastier than it really is. That’s a big clue that the dreamer’s fear of spiders is blown out of proportion. He makes it bigger than it really is. Spiders in general are no threat to humans, but if you fear something you give it power over you. Since the dreamer admires the co-worker, the co-worker’s presence in the dream is a suggestion. The co-worker doesn’t fear spiders, and the dreamer can use that as an example. We learn from and model ourselves after the people we admire. This dreamer can learn to overcome his fear of spiders by emulating the co-worker. Interpret your dreams? I will give you what you need to get started. Subscribe now by clicking the banner. And this next tidbit is interesting. 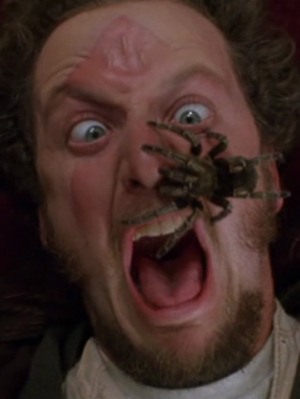 Turns out, research has shown that the greater a person’s fear of spiders, the bigger spiders appear to them. Here is a dream featuring an ex girlfriend and spider webs. The intrigue and “tangled web” she weaves…. Find entries for spiders, snakes, and many more creatures here. Some kid from the grade above me back in high school is with me in my old town lifting up sewer grates to show me that there are tunnels under them. Suddenly I realize there is a Black Widow on me, no matter what I do I can’t get it off ’cause it crawls somewhere else or its webs are stuck on me. It never bit me though. But I felt uneasy and it made me wake up. The dreamer associates his ex-girlfriend with a Black Widow. Her schemes are the webs that stick to him. The underground tunnels symbolize the underhanded way she’s trying to tunnel back into his life. He can’t seem to get rid of her. So first up, I should mention I actually really like spiders. I have a pet spider and took care of my science teachers pet spider over summer break. But eventually it *really* wanted to get out so I was like “okay, fine. It’s probably hungry anyway” and then I remember thinking “it’s safe to take to the pet store” cuz it had a mask thing on so it wouldn’t bite or get sensory overload and it also separated 4 front legs from the back ones, so I put a little harness on it and off we went to the pet store. So this thing literally acted like some kind of hyper puppy cat mix like it was jumping around everywhere but behaving enough for me to not get mad and it hissed at a dog and the people there were freaked out because _its a goddamn spider_ and I remember looking at the fish for some reason. Then I got home (new apartment) and put up plexiglass walls enough so you could walk around the outside of those walls (like an aquarium) and I guess I bought dog stuff cuz I had a doghouse for it’s hide and a giant dog bowl for its water and then I let it loose inside and it was just *so happy* and then I gave it a ton of crickets and cockroaches and super worms. Then I woke up. What an interesting dream. Your experience with spiders certainly puts a twist on the dream about it. Perhaps your dream shows your desire to share your interest in spiders. Most people perceive them as scary, and you want to show that they’re not so scary. They can even be pets. We’ve got those here in Texas too! We call them garden sperids. There is one outside our master bedroom window. I think they’re beautiful. And they catch a lot of bugs. I think it’s kind of neat that if you get too near their web, they start shaking it back and forth, warning you off. I don’t believe they’re poisonous, are they? Now if we could only get rid of all the scorpions, black widows, and brown recluse that you find in these parts . . .
Last night I was sitting on the porch here in AZ, talking on the phone, when a tarantula crept by within a couple feet of the chair. Even though I know they’re not harmful, they still give me the willies. But they eat scorpions, and we’ve got those, too, in abundance! Next story Man Gives Birth to Kitten in a Dream. What Does It Mean?